Baked eggs, or Shakshuka is having a moment right now, and for good reason. Rich tomatoes, soft runny eggs…it’s downright divine. What better way to embrace this trend than by adding in some more of your breakfast favourites like halloumi and chorizo to create a next level shakshuka they’ll be begging you to make again and again. Shakshuka is a Middle Eastern and North African dish, which is often served for breakfast with bread for dipping. The eggs poach in rich tomato sauce. 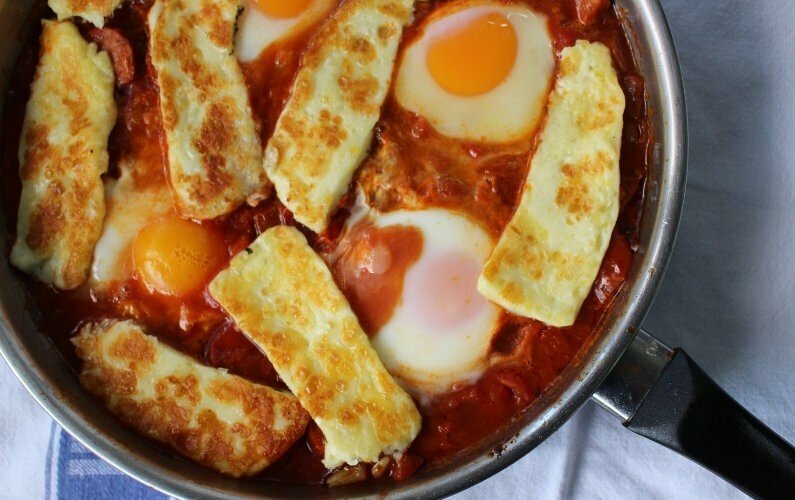 Our Shakshuka recipe uses Olympus halloumi and your favourite chorizo to create a gorgeous one pot dish for breakfast or any time of the day. 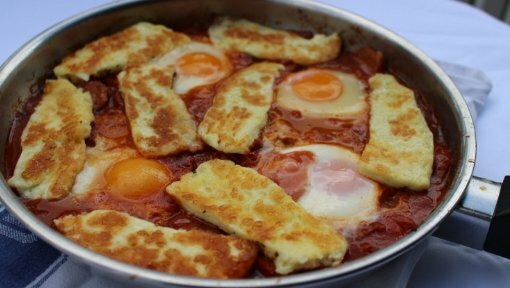 You could also swap the halloumi for crumbling in some creamy fetta, which produces a more traditional version of Shakshuka. Both ways are delicious! Heat oil in frying pan and saute onion and capsicum until soft. Add garlic and chorizo, frying until both both colour and release their aromas. Add paprika, cumin and chilli to the frying pan, working until fragrant. Add tomatoes and crush with a spoon into the mixture. Bring to the boil then simmer for 5-10 minutes to develop the flavours. Add salt and pepper and pinch of sugar to taste. Make small holes in the tomato sauce with a wooden spoon, and then crack your eggs into them. In a separate pan or in your grill, fry halloumi on a medium heat until golden. Meanwhile, cover shakshuka and cook on med-low for approximately 10-12 minutes, or until the egg white is set. You can leave your yolk runny, or cook it all the way, depending on your preference. Cover with cooked pieces of halloumi. Squeeze lemon juice over to serve.